Jay Leno brought comedy and cash to the Mississippi Gulf Coast to help the area recover from the BP oil spill. More than 1,000 people watched Leno perform Saturday night at the Beau Rivage Resort and Casino in Biloxi to raise money for the Gulf Coast Community Foundation. Tickets were $40 to $150. At the end of the show, Leno presented an oversized check for $90,336 to foundation president Rich Westfall. 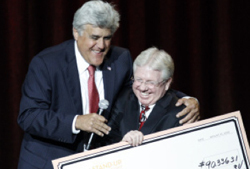 Leno chipped in some of his own money, topping off the evening’s fundraising total at about $100,000.